Wave Relay® MANET developer will support Endeavor’s award by providing radio network for FirstLook® Unmanned Ground Vehicles (UGVs). 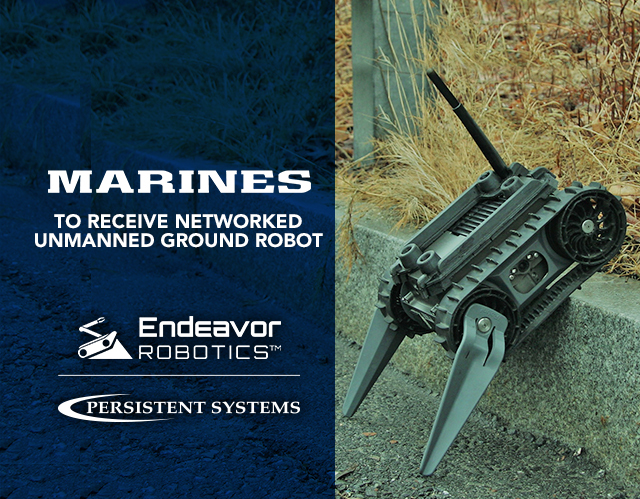 New York, N.Y. – Persistent Systems, LLC (“Persistent”), developer of the Wave Relay® mobile ad hoc network (MANET), announced that they will supply radio network technology and systems for Endeavor Robotics’ recently announced order from the U.S. Marine Corps. Under the $10 million award, Endeavor will provide the Marines with its FirstLook UGV, a five-pound, ruggedized surveillance robot supported by the Wave Relay® MANET. Based in Chelmsford, Mass., Endeavor Robotics is the world’s largest supplier of tactical unmanned ground vehicles, delivering more than 6,500 robots to customers in over 40 countries. We design and build the most trusted, rugged, easiest-to-operate robots used to safeguard life and property around the world, whatever the mission. Every day, our products operate in areas of conflict, assist law enforcement agencies, and respond to natural disasters to help save lives. Endeavor Robotics is 100% U.S.-based. Visit us at EndeavorRobotics.com, or view jobs and more on LinkedIn.